In Western culture, dreams hold different weight for different people. Some of us examine our REM reveries to make sense of our daily lives; others see a dream as a real place, one they can visit and interact with its inhabitants. Still others see dreams as nothing more than a fluttering of subconscious gibberish. For most people, however, one thing is certain: A firm line of demarcation separates the dream world from the real one. No such line exists for Australia’s aboriginal people. Their complex belief system is based on the fact that the world was formed in the dreams of the the Creator. Every feature of the earth, they believe, exists in both realms — in a place called “The Dreamtime.” Only by looking at the realms together can someone fully understand their ancestry and place in the world. The dream of the creator is an ongoing mythic reality that’s overlaid onto features of the earth and points the way to cultural touchpoints and truths embedded in the land. 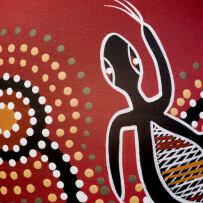 For aborigines, dreams and reality are one.